Italy’s new Prime Minister Enrico Letta and his new cabinet were sworn in with special ceremony at the presidential palace on Sunday. Reports say Letta’s ministers delivered swear allegiance to the republic before Italy’s President Giorgio Napolitano. President Napolitano personally picked Letta as prime minister. The cabinet is composed of diverse government of politicians, record number of women and economic experts. US Secretary of States John Kerry today issued a statement congratulating Enrico Letta on being sworn in as Prime Minister of Italy. He says Prime Minister Letta is a good and trusted friend of the United States who has demonstrated a firm commitment to our trans-Atlantic partnership throughout his career. 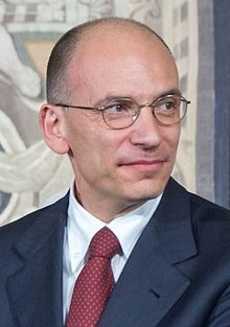 Enrico Letta (pronounced is an Italian politician and the current President of the Council of Ministers of Italy. The US wishes him the best as he promotes reform at home and ensures continued Italian leadership abroad. Secretary Kerry says the US government looks forward to continuing its close cooperation with Italy on many pressing issues all over the world. Who is Prime Minister Letta? Prime Minister Letta was born in Pisa, Italy. He finished a degree in political science and a doctorate in European Community law. In 1998, he became the youngest minister in Italy’s history when he was appointed minister for community policy at the age of 32. He also worked as industry and commerce minister until 2001. 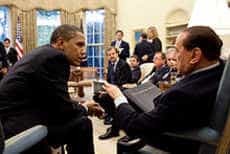 US President Barack Obama meets with Italian Prime Minister Silvio Berlusconi. Letta is reportedly a supporter of football club named AC Milan which is owned by Berlusconi. Prime Minister Letta made headlines for his determination to reform the parliamentary system. Earlier this week, the 87-year-old Georgio Napolitano was once again elected as Italy’s president in a joint session of the Italian parliament. Reports say President Georgio Napolitano has won another term as president with 739 out of 1,007 votes cast for his reelection. The incumbent president’s term of office expires on May 15 this year. Mr. Napolitani accepted the reelection proposal when appeals from representatives of the centre-left camp and the electoral alliance have convinced him to accept another term. However, media reports say Napolitano’s reelection can only serve as a short-term and as a temporary solution to country’s political crisis. Many say it is unlikely the 87-year-old will remain a further seven years in office and fulfill his duties during the term. The United States of America and Italy have reaffirmed strong allience on countless international issues in the 21st century. Italy is such a close friend and ally, a critical partner on countless international issues, and the US look to Italy to lead on many of those issues. Both countries are working together to strengthen sanctions and the violence inflicted by the Assad regime and encourage a peaceful democratic transition. In addition, both countries also worked together during the course of the last year with the Monti government on economic reforms in Italy and elsewhere. The United States is really encouraged by the leadership shown by the Monti government, and Italy’s progress. Both countries’ close ties in investment and business really demonstrate that both are in this together, and both will grow together. Italy is the fourth largest contributor to ISAF, the International Security Assistance Force, and leads the ISAF mission in Regional Command West. And Italy has been very generous in committing to help sustain the Afghan National Security Forces after 2014. Both countries are committed to the roadmap set forth first in Lisbon and then in Chicago, and both are very grateful for Italy’s contributions and leadership. In May 2011, Secretary of State Hillary Rodham Clinton met Italian Foreign Minister Franco Frattini in Rome Italy. While in Rome, Ms. Clinton stressed that Italy and the United States collaborate on a range of critical issues from counterterrorism to peacekeeping. Ms. Clinton underlined that Italy is not only US NATO ally, but also US partner in the G-8 and the G-20, and a nation that shares Us democratic ideals and US commitment to prosperity, peace, and progress. The United States and Italy have stood shoulder to shoulder along with NATO and our regional partners. Italy has provided assistance in building secure and prosperous societies in Iraq, Afghanistan, Lebanon, and the Balkans.